Start a big pot of water on high for the pasta. Cut chicken into nice bite size pieces. Add olive oil to a large pan and sauté the chicken. Slice the farmer sausage into bite size pieces and add to the chicken. Cook for a few mins till both are done cooking. Set the meat aside. Clean and chop the broccoli and cauliflower into small bite size pieces. When the water is boiling, throw in your pasta and follow the direction on the pasta box to cook till al dente. Add the onion and the garlic celery to the pan and sauté. Cook for 2 mins and then add the carrots. Cook for about 2 mins then add the cauliflower and broccoli cook for another 2 mins. You don't want to over cook these now because they will be mushy and that's no good. Pour the chicken broth in the pan, but reserve 1/2 a cup, bring to simmer then add the cream cheese and the sun dried tomato pesto. 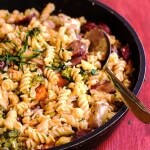 Add drained pasta to vegetable and meat mixture. Add the cornstarch to the remaining chicken broth till its dissolved, to make a slurry. Then add to the pasta. This will thicken the sauce once it starts coming to a boil. Once the sauce has thickened it is time to enjoy your pasta. Sprinkle with parmesan cheese if you like and serve.